Strenuous, several areas of climbing, significant elevation. I found another of the most beautiful locations in Rhode Island. The trails on this hike are on abutting Nature Conservancy, Audubon, and State Management properties. Starting from a very small parking area I followed the yellow trail (which is part of the Narragansett Trail) literally climbing over several rocks, boulders, and outcrops at points. 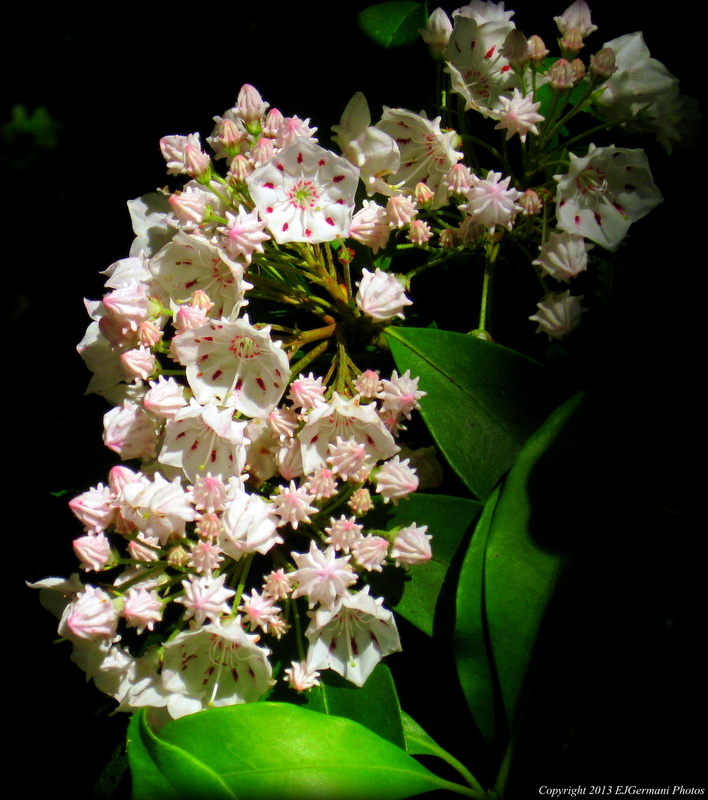 At the time of this hike the mountain laurel was just beginning to bloom, which added to the beauty. 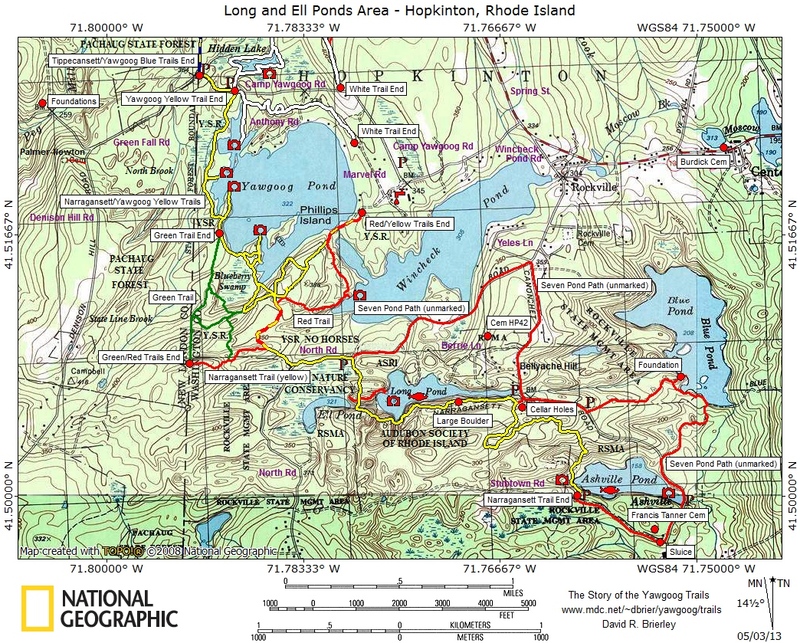 I reached an intersection with signage for Long Pond, Ell Pond, and Hemlock Forest. I first followed the path to the right (passing the yellow blazed trail) toward Ell Pond. The trail is unblazed and ends near a pine tree with a number 3 sign on it. At this point you can see Ell Pond through the trees. I suspect at one time there was a better view of the pond. I then retraced my steps back to the intersection and followed the path toward Long Pond. 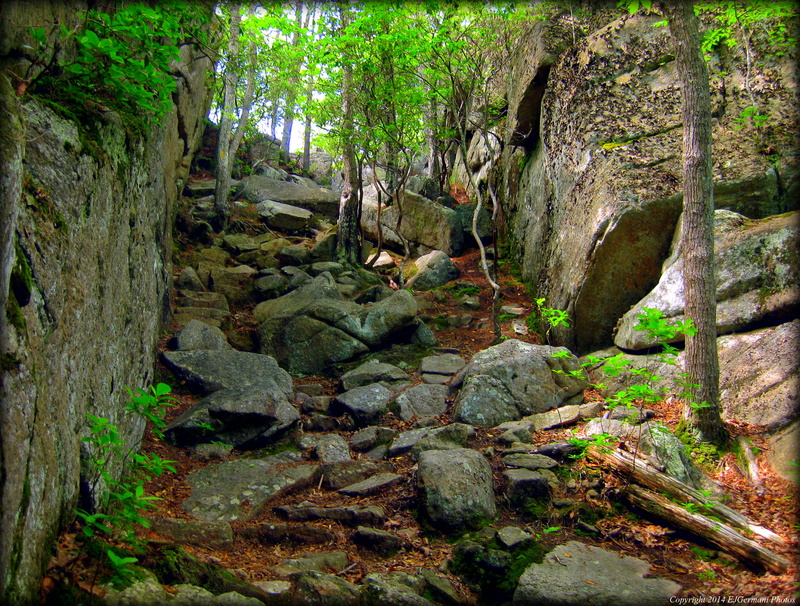 The trail, also unblazed, winds up and down and comes to an area of a massive rock cliff. The trail climbs the rock cliff to a truly breathtaking (partly, because I’m out of shape) view of Long Pond. I found myself spending a little time here just taking in what nature has to offer. At this point you are less than a half mile or so from where you started. If you find that this section was difficult I would suggest that you retrace your steps back to the car and make your way to the second parking lot if you choose to hike the less difficult parts. The next section is outright strenuous. Making my way back to the intersection to the yellow trail I was presented with the first challenge; a steep natural rock cleft to scale down. At the bottom of the cleft the trail comes to a boardwalk that crosses a stream then the trail turns left and up a massive hill of rocks and boulders. On the other side is another section of steep decline before climbing yet another large hill. The trail then follows a ridge before a path to the second parking appears on the left. The yellow blazed trail turns to the right and meanders through areas of mountain laurel and stone walls before coming to a massive area of rock. The trail then continues past Ashville Pond and ends at a third parking area at Stubtown Road. This is the eastern end of the Narragansett Trail that starts in Connecticut. I then followed the road to the left passing a historic house to the left and mill remains to the right before turning left onto Canonchet Road. The long stretch road, mostly uphill and forested passes Ashville Pond once again before heading back to the second parking area. From this point I turned right back onto the yellow blazed trail and through the strenuous hills retracing my steps back to the car. This hike took me just about 5 hours to do due to the terrain. I would suggest a backpack with plenty of water for this hike, particularly on warmer days.